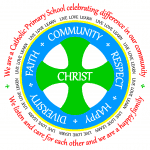 Our Lady of Lourdes Catholic Primary School is a Catholic School which seeks to live out the values of Jesus Christ. As a Catholic school we are fully committed to the values contained within the Gospels. As modern British values have evolved from a time when we were historically Christian, our Gospel values and British values are fundamentally linked and interwoven. In 2011, the government defined British Values as democracy, the rule of law, individual liberty, mutual respect and tolerance of different faiths and beliefs. We proudly promote these same values through our curriculum as a Catholic school as represented in our mission statement. This recognises every pupil is unique and created in the image of God. (Genesis 1:27) Our framework for understanding British Values draws on the example of Jesus and his welcome and inclusion of all, which is the basis of Catholic Social Teaching. At Our Lady of Lourdes we demonstrate this in our teaching and learning. Our curriculum is designed to enable every pupil to be the best that they can be, to be able to discern their vocation and to be well-equipped to follow it as active citizens in service to the world. 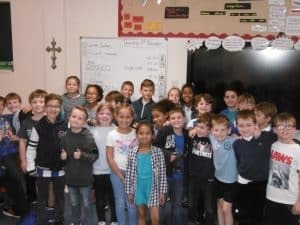 “Blessed are those who hunger and thirst for righteousness, for they shall be satisfied” The children at Our Lady of Lourdes have an elected School Council. This body is used as an opportunity to promote and teach about democracy and the electoral process. We strongly encourage volunteerism both in and out of school. This is demonstrated by the Eco-Council, sports captains, ICT support, lunch helpers, and also raising money and awareness for local and national charities such as The Clock Tower Sanctuary and Mary’s Meals. Democracy is further embedded through topic discussions in additional Education in Personal Relationships (EPR) lessons and assemblies. “Blessed are the peacemakers for they shall be called children of God” Our Lady of Lourdes has high expectations about pupil conduct and this is reflected in our Behaviour Policy. There are also rewards for exhibiting good and caring behaviour, and consistent demonstration of our values is recognised through activities such as ‘Star of the Week’ and ‘Good to be Gold’ awards. Through concrete efforts such as House Points, the Golden Rule programme and Restorative Justice, the children develop practical understanding and become able to articulate their own roles in society. Through our school assemblies, circle time and EPR curriculum, children are taught how to earn trust and respect and they are supported to develop a strong sense of morality; our children are also taught to know right from wrong and to understand making the right choice even when it can be difficult. The local police officer / PCSO visits the school to talk to the children and explain about their role in society, our rights and responsibility to each other. “Blessed are the pure of heart, for they shall see God” Through our school values and the EPR programme, children are taught about personal responsibility, choices, ambition and aspiration. They are also encouraged to take opportunities to follow their interests in drama, art, music, sport, etc. Reconciliation and learning about one’s self and rootedness in community is achieved through collective worship and in Mass. Children at Our Lady of Lourdes are taught how to keep themselves safe in various ways. This includes social media and e-Safety. Our efforts here are also accomplished through computing lessons, assemblies and outside organisations such as the NSPCC, as well as through the EPR curriculum. “Blessed are the merciful, for they shall obtain mercy” We have high expectations about pupil conduct and this is reflected in our Behaviour Policy and Equalities Policy. Through our school’s values, EPR programme, and frameworks such as Restorative Justice, bubble time and circle time, our children are taught to respect each other, to be cooperative and collaborative, to be supportive of one another, and to look for similarities while being understanding of differences. Mutual respect is also promoted through additional EPR lessons and assemblies. A range of specific assemblies are delivered focusing on helping other pupils to understand particular special needs, be they educational or emotional. The Social and Emotional Aspects of Learning (SEAL) themes are a fundamental part of our deanery EPR programme. Co-operation with one another is also enhanced through cross- peer linkages with Year 6 Buddies and Anti-bullying activities. “Blessed are the meek, for they shall inherit the earth” Our Lady of Lourdes has high expectations about pupil conduct and understanding of diversity. This is reflected in our Behaviour Policy and Equalities Policy. Tolerance of different faiths and beliefs is promoted through the Syllabus for Religious Education. 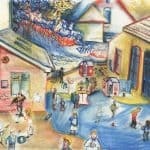 Our children learn about different religions, their beliefs, places of worship and festivals. Moreover, the children’s work on this subject or whole school learning in assemblies is often displayed in the classrooms or around the school. 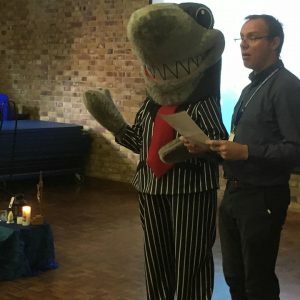 This is further supplemented by assemblies (Key Stage and whole school), which also mark and celebrate significant religious festivals such as Ramadan, Diwali and Chanukah as well as activities at the local Parish church and convent. Diversity is promoted through music, displays, international evenings, drama/stories from other regions and cultures, and through the library’s dual-language collection. EPR is the Diocesan term for curriculum encompassing themes of personal development and can be used interchangeably with PSHE, which is more commonly used by Ofsted to denote that same framework. Individual Liberty and Mutual Respect: The children were given a talk by a representative of the East Sussex Credit Union on the advantages of regular saving not only for the benefit of themselves but their family unit as a whole, to avoid the temptation of approaching a loan shark when faced with financial problems, and not in a position of having access to normal help such as a Bank. An example of borrowing from such person was if £1000.0 was borrowed the repayment sum could be as much as £5270.0. At the end of the talk Mr Beverton gave the children a very good simplified explanation of the points discussed in the talk more easily understood by the younger children. Mutual Respect: We took part in Anti-Bullying week and celebrated Blue Day.